Audio of message, including the sharing of others after I spoke. Today is Pentecost Sunday, when we remember what happened after the Resurrection on the day of Pentecost. As we read in Acts, the Holy Spirit came on them with power and they were enabled to speak other languages so that everyone in the diverse crowd heard them speaking about God’s deeds of power in their own language. None of them had ever witnessed something like that before. In the Hebrew scriptures, there were a very few people, such as the prophets, who heard directly from God, and everyone else heard it second hand from those select people. The scriptures record that the prophet Joel asserted it would not always be that way, but there would be a time when God’s Spirit would be poured out upon all flesh. All flesh – that’s each and every one of us. Peter explained to the crowd gathered at Pentecost that this was being fulfilled on that day. Since the day of Pentecost, we don’t need intermediaries to hear the word of God. Through the Holy Spirit, each of us receives the Word directly if only we will listen. That may manifest itself in many ways. The Spirit may speak to an individual and it may speak to a group. From my life, I will give a couple of examples of the Holy Spirit at work. A little background on the first example. I had a friend named Bruce Baechler. I got to know him through a Vigil for Peace against the Vietnam War in front of the White House which went on 24/7 for almost 3 years. That itself is an example of the Holy Spirit at work since a regional body of Quakers called New York Yearly Meeting had directed it continue as long as the Spirit leads, not imagining this would be more than a week or so. Bruce was a high school student who dropped out of school to participate in the vigil. When Bruce turned 18, he refused to register for the draft and sent in a letter explaining why. This was after inductions under the draft had stopped, but the requirement to register continued (and still continues to this day). Bruce was arrested and prosecuted for refusing to register and spent 2 years in Morgantown Federal Prison. I visited him regularly. One Wednesday evening while Bruce was in prison, I got a call from Marge Baechler, Bruce’s mother. She told me that on the coming Sunday Bill Moyer’s Journal was coming to tape a special meeting for worship at Hartford Friends Meeting as part of a future program on Bruce’s case. She said I was welcome to come. Hartford was a long drive away, and I didn’t know what I would have to contribute at this event. I also had a lot on my plate that I had hoped to do in these days. So it didn’t seem to make much sense to go, but I was feeling a nudge that I should. I decided to take this leading to midweek meeting for worship on Thursday evening. During that time, the leading became stronger. I still didn’t understand why I should go, but I have learned that often with leadings one does not understand in advance. One needs to take it on faith, and the reason may emerge after one has been faithful – or sometimes I never understand but feel that I have been faithful. In the Quaker tradition, one normally does not go alone when traveling under a leading. One has a traveling companion who serves as your elder. The Spirit put on my heart who my traveling companion should be, another person who had been a part of the Vigil named Mark. The last I knew Mark didn’t have a fixed place to stay, and this was long before the era of email and cell phones, so contacting him was an issue. I knew that Mark frequented a café which catered to the alternative crowd and which had a big bulletin board on which one could post messages. So I posted a message there asking him to call me. On Friday morning, Mark called, and I told him about my leading and the role he could play. He readily agreed to be my traveling companion and elder, and we arranged for me to pick him up on Saturday morning for the trip. Mark and I drove to Hartford on Saturday, where we had arranged with the Baechlers to meet with them and some others at the Meetinghouse. The plan had been for us to stay overnight at the Baechlers. However, although we had not discussed this beforehand, both Mark and I at that time felt called to spend the night in the Meetinghouse as part of spiritual preparation for the next day. Those who had met us were surprised at this but agreed to it and figured out how to set things up for our stay. Mark and I stayed up talking. I was very anxious, and it proved very helpful to have him as a companion to calm me down. I remained anxious in the morning, even thinking of not going to the special meeting out of concern it would be a spectacle rather than a true meeting for worship. First the regular meeting for worship was held. Then, after a brief period in which the crew set up their equipment, the special meeting was held. It felt like a continuation of the worship more than something totally separate. The folks who rose to speak in the meeting about Bruce had mostly seen very little of Bruce for a number of years. Their remarks tended to run along the lines of: “Bruce was such a nice young man. It’s too bad he wound up in prison.” It sounded pretty sad. I was the only person in the room who really knew how things were with Bruce. Visiting him regularly, I didn’t see so sad a situation. I knew that Bruce was not at all defeated. Rather I saw that the state could not defeat conscience through imprisonment. The real story was that conscience was not touched by the effort to suppress it. So I was able to speak this truth. Now I knew why I had needed to come. I had a message of hope for those gathered. This was valuable, even though it did not go further since the show was never aired. I felt great on the way home. It almost felt like I was floating the whole way! And remember that I had a lot on my plate? Well, everything I needed to do got done in a timely manner. What are some of the aspects of the Holy Spirit at work this story illustrates? When the Spirit is leading, you may not understand why you are being led to do something. Just be faithful, and don’t insist on knowing why you are led to do it. Things sometimes fall in place in amazing ways to allow the Spirit to work. What faithfulness requires will continue to unfold as you follow the leading. You may be anxious and uncertain, but the Spirit can still use you. When you have been faithful, you may have a great feeling of satisfaction and peace. My second example is of a group being led by the Holy Spirit. I was a Quaker for 4 decades and, like the first example, this occurred in a Quaker context. A little background. Waiting or unprogrammed worship is rooted in silence. The gathered meeting starts in silence, but as anyone feels led they may stand and offer vocal ministry which could be a message, a prayer or a song. The end of the worship period is marked by a designated person – historically someone formally recognized as an elder - shaking hands with a neighbor, after which all participants shake hands with those around them. This is the Quaker version of passing the peace. Historically worship lasted as long as the Spirit leads – sometimes several hours, and so it required someone of spiritual maturity and discernment to have the responsibility of sensing when meeting was to rise. Today, usually meeting is broken close to a fixed schedule, most commonly one hour. Rarely does it last much longer than that, unless it’s been announced as an extended meeting for worship. 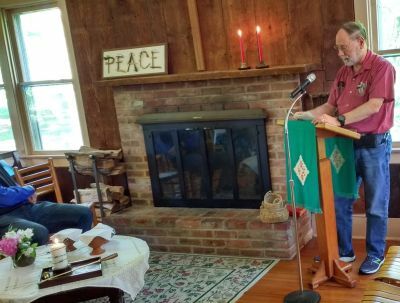 This occasion was at a Triennial session of Friends United Meeting, the largest association of Quakers. There were several hundred present from various parts of the world. It was in an auditorium, with the elders for the evening on the stage. The schedule included a meeting for waiting worship, followed by a meeting for business, so it was a very full evening program. The worship was spirited and lively, with messages, prayers and songs offered in various languages. It was so Spirit-filled that the elders allowed it to run over the hour scheduled a few minutes, but then shook hands. Something astonishing happened that I had never seen before. No one else shook hands after the elders did, and the worship continued as if no one had tried to break it. The elders settled back down and waited for some time before shaking hands again. It was the same as the first attempt. The worship simply continued. Finally, after the worship had gone on about two-and-a-half hours, the elders shook hands, and all responded by greeting their neighbors. It seemed that the Spirit had led the gathering in an extended period of worship, which apparently was what the gathered body needed more than getting to business as scheduled. I have kept my message fairly brief so that more could be heard from. I hope that all of you have felt the Holy Spirit at work in your lives and recognized that numerous times. So I invite anyone who feels moved to share from your experiences with the Spirit to do so at this time. You may come to this mike, or a mike will be brought to you. And if the Spirit leads you to speak about something else, you should also feel free to do that. May the Spirit be heard! NOTES: After I spoke, 6 others shared. Before I spoke, we played Holy Spirit Come by Aaron Fowler. This is a subject in which I have had great interest for decades, but my thoughts have been stirred recently by an event and some things I’ve read. Last month’s Friends of Jesus Fellowship Fall Gathering, in which there was quite an outbreak of the Holy Spirit. See When We Pray, It Boils by Micah Bales, A Weekend with Some Friends of Jesus by Hye Sung Francis Gehring, and Friends of Jesus Fellowship and Quaker Renewal UK by Mark Daniel Russ. Some posts by Steve Simms of The Salvation Army Berry Street in Nashville. See People Get Ready There’s A Train A Comin’ — (Get On Board The Revival Train), The Phantom Commandment Challenge — Church Without A 1-Man Sermon?, and Puzzle Pieces, Potluck, & Permitting Every Person (Not Just The Parson) 2 Participate. A number of years ago I attended an independent charismatic church. At that time, they had a Friday evening service which was not programmed in advance. There was a pastor of the church who, in Quaker terms, clerked the service, helping it to flow as the Spirit led. At the beginning, you would see people talking to him, relaying what the Lord had said to them about what needed to happen that evening. The character of the service varied enormously week from week, as the Lord led. But most of what was vocalized was from the floor of the church. The only standard thing which happened is that, sometime during the about 2.5 hour service, bread and juice would be put out giving the attenders opportunity to take communion. That period would usually be pretty quiet. People often took some time to pray before consuming the elements, frequently kneeling on the steps which are used in place of an altar in that church. I really appreciated this service. Unfortunately, the church stopped doing it. The Quaker tradition is to have worship in which there is not a program set in advance, but the Lord may speak through anyone gathered. However today most Quaker groups which are still non-pastoral have moved away from a center in Jesus Christ, and generally the range of expression which is acceptable is limited by a somewhat repressive WASP middle class cultural environment. I have been at a couple of Quaker gatherings where a session broke free from those restraints, and a vibrant, charismatic session resulted. However, that is rare. I suspect a major reason why the kind of participatory worship Paul recommended to the church in Corinth is so rare is fear. What might happen if the Spirit was allowed to work in the congregation free from control by one or more leaders and from cultural constraints? It seems so much safer to keep things under human control. So I have this concern for finding and nurturing spiritually alive participatory worship. I would appreciate reflections on this subject and any pointing towards where I might find such worship or how I might facilitate it.